A portable and affordable engraving marking system that's convenient, easy-to-operate and can replace your manual engraving machine or the need to outsource your marking tasks. Designed for engraving on flat objects such as trophy plates, luggage tags, small gifts, badges, leather gifts, pet tags and jewelry. M20 3-Axis Diamond - Diamond Drag engraving on objects such as trophy plates, small gifts, pet tags and jewelry. M20 3-Axis Dedicace™ - Same model above combined with a software solution that provides the ability to engrave hand written sentiments and elegant messages. A unique personalizatoin service, adding sentimental value and thought to each gift. 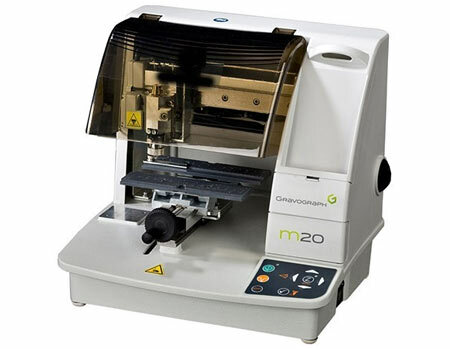 M20 4-Axis - Quickly change over from engraving on flat objects to engraving on cylindrical objects. Designed for engraving pens, small gifts, flat, round and cylindrical objects, as well as jewelry.